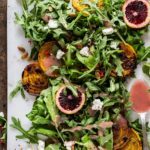 This arugula salad with roasted golden beets paired with a blood orange vinaigrette is bursting with color and flavor. Peel and chop golden beet. Bake at 400 degrees for 30 minutes or until fork tender. Place all remaining ingredients in a large bowl and toss together. Add cooled beets and top with dressing. Put all dressing ingredients in a high speed blender except oil. Slowly drizzle in oil until emulsified. Serve with Arugula Golden Beet Salad.